Aust. Gr. Ch. Devine Thats-My-Opinion Imp NZ. AUSTRALIAN GRAND CHAMPION DEVINE THATS-MY-OPINION IMP. NZ. The greatest gift a dog show person could ask for. 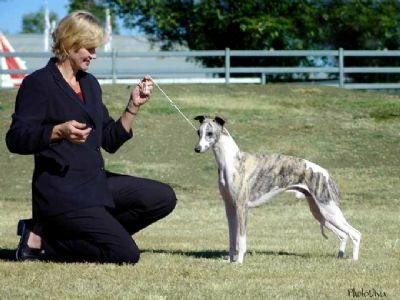 Thatcher was given to me by my dear friend Internationally respected whippet breeder Nicole Harrison (Devine Whippets NZ.) Thatcher was a Royal BIS winner, a multi all breeds BIS winner & multi RUBIS winner as well as many BIG's. He won under breed specialists as well as Australian & International All Breed judges. 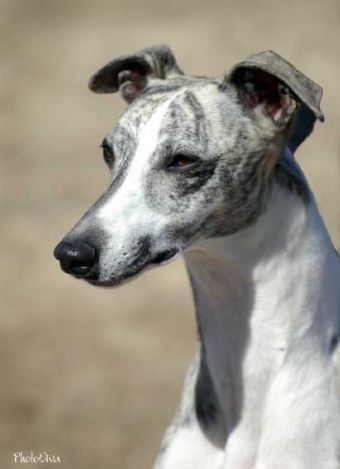 My gratitude must also go to Jackie Newton (Kana-Ka Whippets NZ.) Thatcher's co-breeder for her part in breeding him. 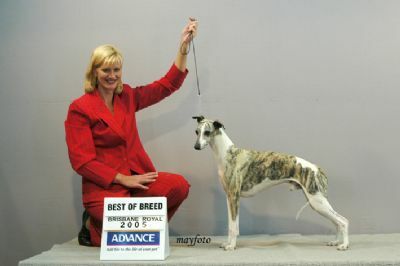 He came from a long line of SBIS & All Breeds BIS winners both in Australia & Overseas. Thatcher proved himself as a top sire producing 2 Grand Champions, many Champions & BIS winners at both All Breeds & Royal Shows. I shall always cherish the time I had with Thatcher.I am eternally grateful for the progeny he left me & the wonderful little frozen tadpoles that may one day bring a little part of him back to me. Pedigree for Aust. Gr. Ch. Devine Thats-My-Opinion Imp NZ.